This is an accidental wall. And has ended up being my first in a long time wall made 'just because' or better explained as a wall without a WG-2 Match to attribute this too. See, I was making my own V-day decorates and needed something for the front door. So, I whipped together something simpler then the one I'm giving you. Though, the simpler one is uploaded as well as the Alternative wall. This new version took a little more time then what I expected. Since, the simple version was made by half inspiration and half happy accident. I guess I was hoping for the same and after about 7 different idea's. I thought I had it and was ready to save. Then as I was cleaning the unused layers. I accidentally merged two layers. And wouldn't you know... Thank God... it was the final piece I needed. Which was the very very light gray on the outside of the colored middle frame. Why was it needed? Because on most desktops with lots of icons... like my own... white backgrounds aren't usually eye friendly to the icon or icon text. So, it was my final happy accident. 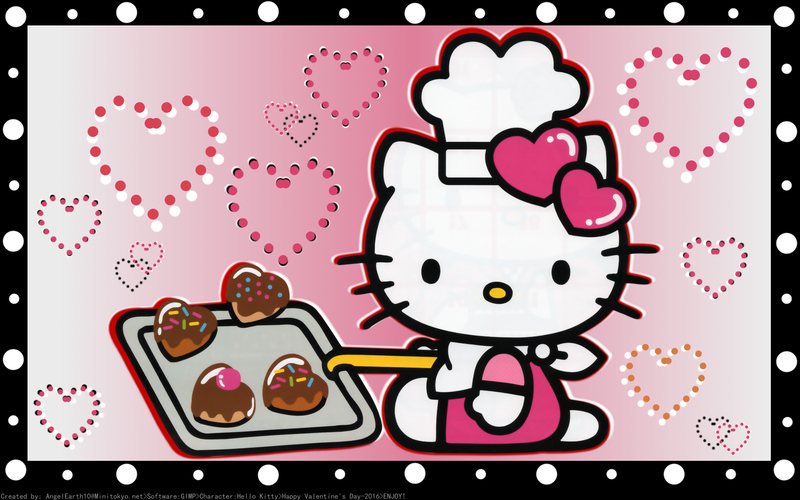 The background was kept simple because its Hello Kitty and how can you fight that cuteness! The hearts were my version of the original background. My way and pretty much nothing like the original background. As you see in the following image. So, with that I hope you enjoy this wallpaper all year round. Very cute wallpaper, well done..